The Heritage Hall located at the rear side of the main Temple is available for rent in line with HTSM policies and guidelines subject to availability. HTSM sponsored events and HTSM pre-approved classes fall under the preferred utilization. The Hall is rented for Religious and family functions in line with HTSM guidelines. Religious groups can rent the hall without any charges. On such occasions, no food or drinks are allowed for distribution. Prasad distribution is allowed only for HTSM sponsored events. Any individual sponsoring personal pooja services at the main temple are allowed to use the hall for a maximum for 1.30 hours (including preparations) free of cost and subject to availability for Prasad distribution to their invitees. It is the responsibility of the individual to keep the premises clean after use. For such occasions, cooking in the temple is not permitted. Note: The Temple will charge $50.00 for each additional hour. Note: Users are permitted to bring their own music system with prior specific approval. Preparations and cleaning must be completed in the allocated time slot for that event. Caution deposit and rent must be paid in advance to reserve the hall. Caution deposit will be returned after the verification. 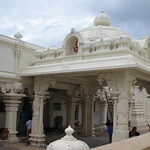 If the caution deposit is not enough to cover any damages, the temple will send an additional bill to cover the expenses. Refund of the amount is permitted when the cancellation is made 2 weeks before the event. It is the responsibility of the user to clean up the hall and surroundings used for their function to be kept clean after the event. Tampering with the thermostat and other equipment are not permitted. Users should ensure that their activities does not interfere or hamper the activities in the main temple and the neighborhood. User to indentify HTSM against any damages/claims that may arise in the course of their occupancy and usage. Fireworks are not allowed in the Temple or around the temple premises. Use of the hall is classified into two categories: Religious use and Family use. Family Hindu religious ceremonies such as Mundan Upakarma, Wedding, Seematham/Baby shower, 60/80 year religious birthday function and etc. Only vegetarian food is allowed. 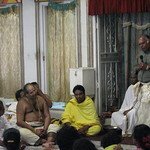 Alcoholic beverages and tobacco products are not permitted anywhere on the temple premises.